Oh my. What a terrible name. No one has thought this through, have they? No one is going to call Crossrail ‘The Elizabeth Line’. How often do you refer to the cable car as ‘The Emirates Airline’ – never, how often do you call Boris Bikes ‘Santander Cycles’ – also never. And here’s the main reason why: It’s got too many syllables! It’s a long name, which makes it sound clunkly, and wordy, and too long to say – and in London, we’re in a rush and we need something shorter. Or – imagine you’re down the pub after a few drinks, “I’m gonna get the tube home” you’d say. And not “Underground”, because tube is a one-syllable word. We like to say things that are quick and easy, and ‘Elizabeth’ is word that you have to annunciate properly, otherwise don’t bother saying it at all. Six out of the 11 lines – more than half – are three syllables or less. ‘Metropolitan’ gets easily shortened down to ‘Met’ all the time, some shorten the Piccadilly to ‘Picc’ and then everyone says ‘H&C’. The Waterloo & City is the least used line and sometimes even we forget that it’s on the tube. (Supposedly it’s nicknamed ‘The Drain’ but we haven’t heard anyone use that name for it for years either!). The one other odd one – strangely is also the name of a Queen is Victoria, which is four syllables, but it’s also a shorter word, but also if you say it quickly enough you can say it two part ‘Vic’ and ‘Trria’ and people know what you mean. The problem with Elizabeth, is that you can’t shorten it to ‘Eli’ – the first few characters like you do with the Met and the Picc (and even the ‘Vic’ for Victoria) meaning that you’re going to have to shorten it to ‘Liz’ or ‘Lizzy’ instead which just sounds stupid. 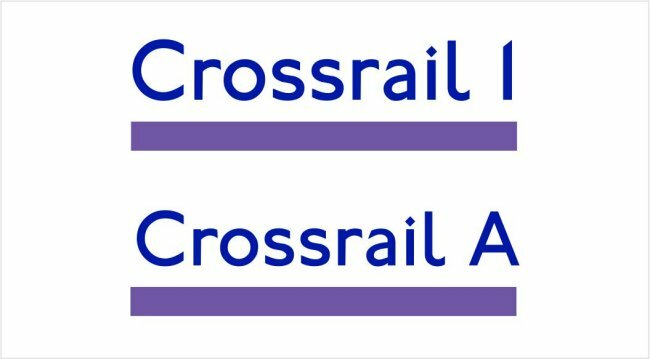 ‘Cross-Rail’ itself is also a simple two syllable word, and – more importantly – is what everyone has been calling it already for the past five years. So no one … no one is going to call it ‘The Elizabeth Line’. People are going to call it what it’s already be branded for ages. If you wanted us to call it ‘Elizabeth’ than it should have been called that from the start of construction – it’s too late now. Here’s another thought too – It’s not an Underground service, so why call it … Line? Only tube lines have the word ‘line’ on the end. The other TfL services being ‘London Overground’, ‘DLR’, ‘TfL Rail’, none of which have the word ‘line’ in them, so by calling in ‘Elizabeth Line’ to us suggests that it’s now part of the tube – which it’s not. It’s Crossrail. It deserves and needs its own identity. Don’t stick the word ‘Line‘ on the end! The other complication comes of course when Crossrail 2 is built in a few years time. So – that’s going to need a name too! That offers up the worrying prospect of it being called ‘The Charles Line’, or ‘The William Line’, which sounds even more silly than ‘Elizabeth’. No, for us – we should be taken a lead from what the French do here, with their RER lines in Paris. The RER (the Réseau Express Régional) is identical to what London is building with Crossrail – trains that run far outside the capital but then go underground like a metro style service when it gets to the centre. The French name their Crossrail style services ‘RER-A’, ‘RER-B’ and so on up to ‘RER-E’. So we do the same here and have ‘Crossrail A’ or even better we think, number than and abbreviate down Crossrail to ‘CR’, so that you’ll have ‘CR1’ and ‘CR2’ on the map. This has the advantage of taken up less space on the map as well, which is already cramped and space is at a premium. The other slight insult about all this is again how we’re stuck with multiple orange-coloured Overground lines, but they’re all the same name – Overground. If ever there were some lines on the tube map that were in desperate need of re-naming, it’s the Overground. Not Crossrail which – oh, did I mention? – we’ve already been calling it that for several years now. It’s in the public lexicon. So now is the time to rename the different Overground lines to ‘OG-1’ or ‘OG-A’ to differentiate between those different services too, thus make ‘CR-1’ or ‘CR-A’ even more sense. So anyway – that’s what we’d like Crossrail to be called please, TfL. ‘CR1’. We’ve even done a graphic for you. Are we too late? Any chance of a re-think? Thanks. This entry was posted on Tuesday, February 23rd, 2016 at 7:07 pm	and is filed under Crossrail. You can follow any comments to this entry through the RSS 2.0 feed. Both comments and pings are currently closed.